Ready for the best Oreo Cheesecake recipe in the world? 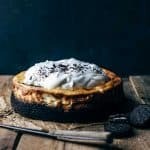 Two ingredient Oreo crust filled with super creamy and tasty Oreo cheesecake filling. Just 8 ingredients and 15 minutes prep time. 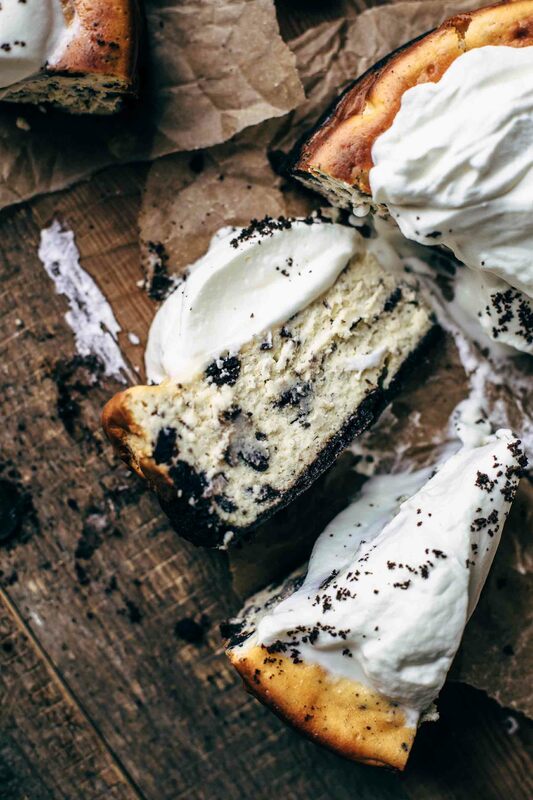 With this easy Oreo Cheesecake recipe, you will never have cracked cheesecake again. With video! Who else was already facing the moment when your cheesecake was cracking? Me too! But this is over now. Actually, it’s not a big deal when the cheesecake cracks because it is delicious either way. But for the eye, it’s more appealing when the cheesecake doesn’t crack. Even if this Oreo Cheesecake doesn’t crack doesn’t mean that you can’t top it with a ridiculously amount of whipped cream like I did. I have to admit that I’m addicted to whipped cream. Crunchy Oreo crust combined with creamy Oreo cheesecake filling and topped with lots of whipped cream and crushed Oreos on top? Jackpot! 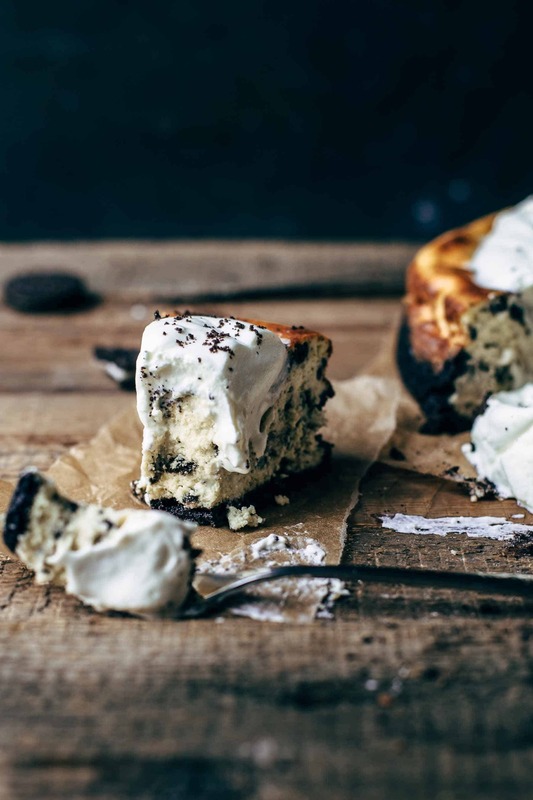 This Oreo Cheesecake recipe is actually an adaption of my favorite New York Style Cheesecake. I modified the crust, and the filling is the same just with crushed Oreos. If you have serious New York Style Cheesecake cravings than take 2 cups graham cracker crumbs, 1/4 cup granulated white sugar, and 1/2 cup melted butter and make the crust as described in the recipe below. To get Oreo crumbs, place Oreos in a food processor and pulse a few times. Alternative you can put them in a zip-lock bag and smash them with a rolling pin. The crust is super easy to make. You just need the Oreo crumbs and melted butter. Stir both ingredients to combine and press into the bottom of a 9″ springform pan. Freeze until you are done with the filling. The filling is also super simple to make. Beat cream cheese, sugar, and flour until creamy and combined. Add one egg at the time and mix until fully incorporated. Then add heavy whipping cream and vanilla and stir until smooth and creamy. I always use vanilla beans instead of pure vanilla extract because I love real bourbon vanilla. But it’s up to you. If you prefer to use pure vanilla extract, then go for it. The filling is beyond delicious. Like I said before when you skip the crushed Oreos it is a New York Style Cheesecake filling. 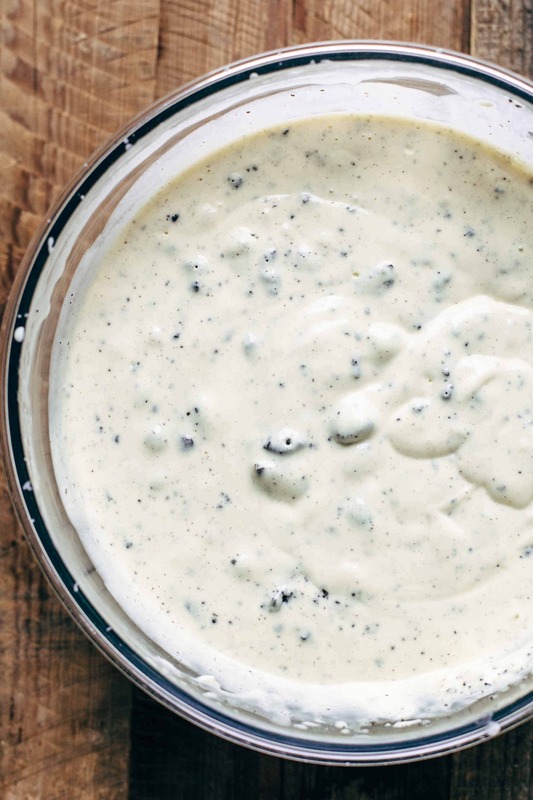 This is the best cheesecake filling you will ever have. The combination of the sweet Oreos with the intense cream cheese flavor is to-die-for. For the filling just crush the Oreos with your fingers roughly. Don’t remove the Oreo cream filling. Also not for the crust. Don’t overmix the filling because when the eggs are beaten too much, the air in the filling can cause cracks while baking. Let the oven closed while baking. Temperature changes are also a reason for cracking cheesecakes. The filling should be almost set with a 2-3 inches wobbly spot in the center. The edges should be puffed (see photo number 3 – you can see that the cheesecake is very bright in the center and just the edges are browned). Don’t bake until the cheesecake is completely set. After baking, crack open the door and let the cheesecake another hour in the oven. Then cool to room temperature before chilling in the refrigerator. 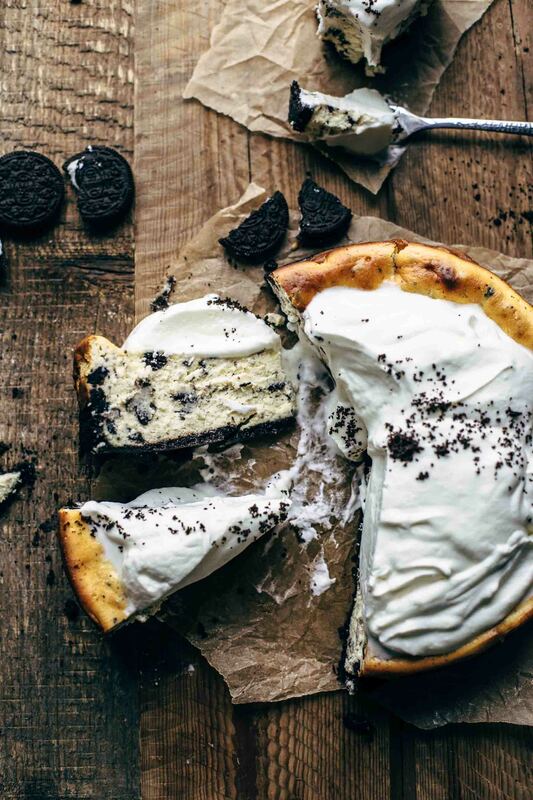 In the picture above, you can see how awesome the texture of this Oreo Cheesecake is. Mario is not that much into whipped cream like I am. I had to remove the whipped cream from his pieces. But this was absolutely ok for me because the whipping cream was going straight on top of my pieces. It doesn’t matter if you are on the pro whipped cream team or not. 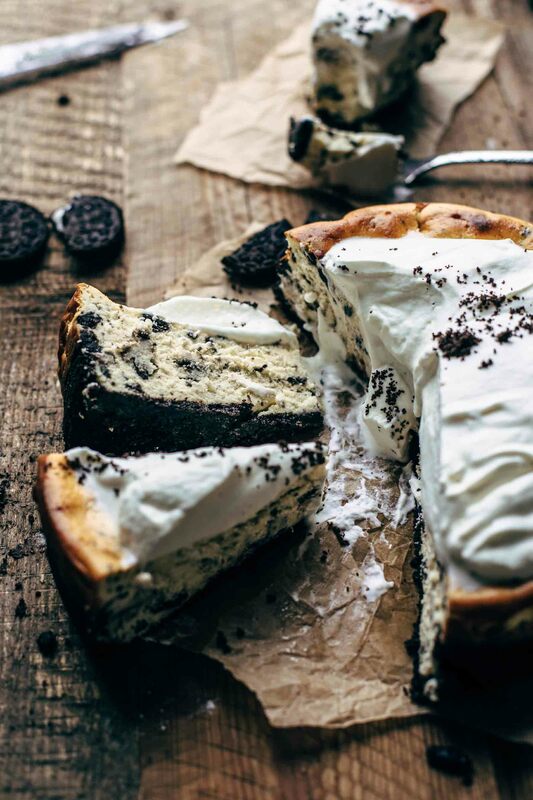 This Oreo Cheesecake is delicious with or without it. Honestly, I’m so obsessed with this recipe that I’m now thinking about to make an ice cream version out of it. I’ll let you know. I think you need to extend your Oreo cookies stock. 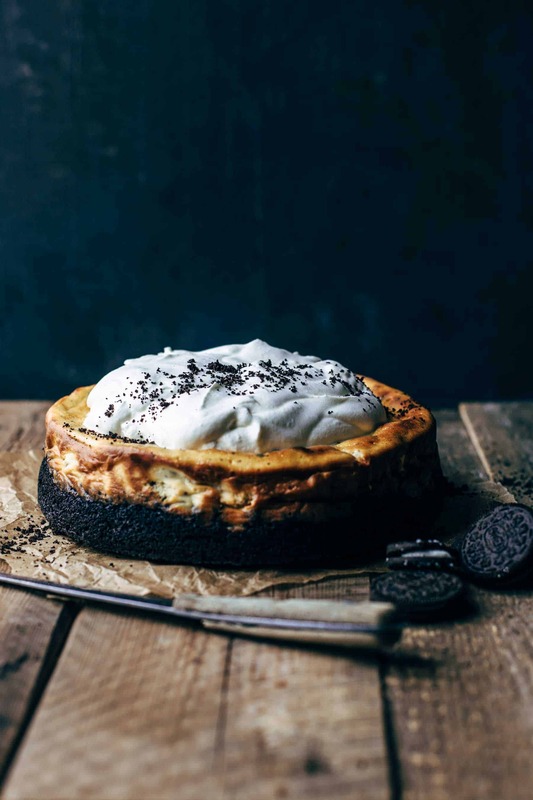 If you make this Oreo Cheesecake recipe, leave a comment, rate it and tag a photo #alsothecrumbsplease on Instagram! Would love to see your snap! You may also like No-Bake Strawberry Cream Cheese Pie Recipe, Blueberry Cheesecake Muffins, Salted Caramel Pretzel Cheesecake Bars, Moist Carrot Cake with Cream Cheese Frosting, or click here to see all things sweet. Oreo Cheesecake Crust: Line a 9" (23cm) springform pan with parchment paper or grease with butter or non-stick spray. Set aside. In a large bowl stir together Oreo crumbs and melted butter until combined and evenly moistened. Transfer to the prepared pan and press crust into the bottom and halfway up the sides with the back of a measuring cup. Freeze until filling is done. 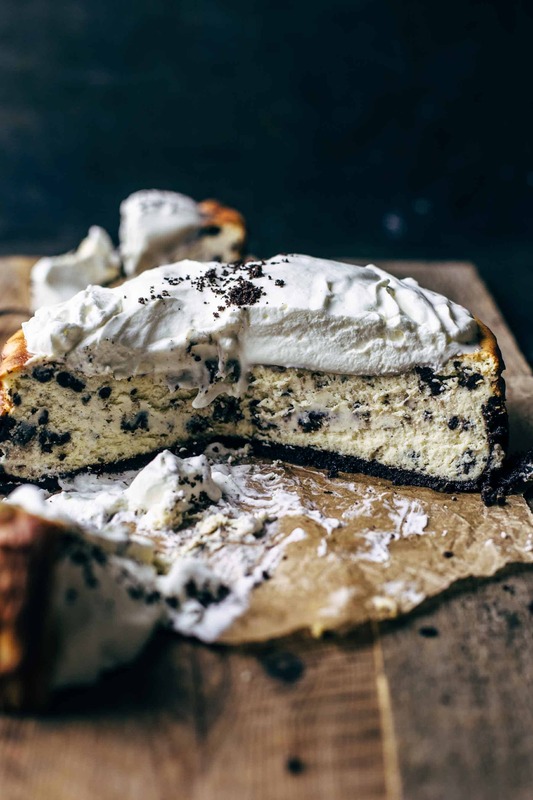 Oreo Cheesecake Filling: In a large mixing bowl, using a handheld or stand mixer fitted with a whisk or paddle attachment, beat the cream cheese, sugar, and flour until smooth and no lumps remain for about 2 minutes. Add one egg at the time and mix just until combined before you add the next egg. Scrape down the bowl and add vanilla* and heavy whipping cream and mix until creamy. Don't overmix. Too much air in the filling can cause cracks while baking. Roughly crush Oreos with your fingers and fold into the filling. Pour filling into the crust. Spread evenly. Place a piece of parchment paper under the springform pan and bake for 45-55 minutes until the edges look puffed and browned. The center should be very bright and almost set with a 2-3 inches wobbly spot in the center. Don't overbake because this is a common reason for cracked cheesecake. Turn off the oven, crack open the door, and let the cheesecake in the oven for another hour. Then remove from the oven and let cool to room temperature. Refrigerate at least 3 hours or overnight. Top with whipped cream and Oreo cookies before serving, if desired. Store leftovers in an airtight container in the fridge up to 3 days. So sorry to hear that, Lynda. There are a few things that can cause cracks in cheesecakes. First thing, don’t overmix the filling, just until incorporated. The next thing what can cause cracks is when you open the door while baking. Cracks are often caused by temperature changes. Like in the recipe described, the cheesecake shouldn’t be completely set. The filling should be almost set in the center with a 2-3 inches wobbly spot in the center. Overbaking is the most common reason for cracked cheesecake. After baking, crack open the door and let the cheesecake another full hour in the oven. And my last tip: always use a springform pan. Consider these tips and you won’t have any problems with cracked cheesecake anymore. I love it. it was the best cheesecake I’ve ever made in my life. next time I try the new york cheesecake. thank you! Great, I’m happy you like it, Jen! Thank you so much. Great recipe. It was delicious. I will make it for Easter again. Do you have a no-bake recipe of this too? Thank you so much, Alia. 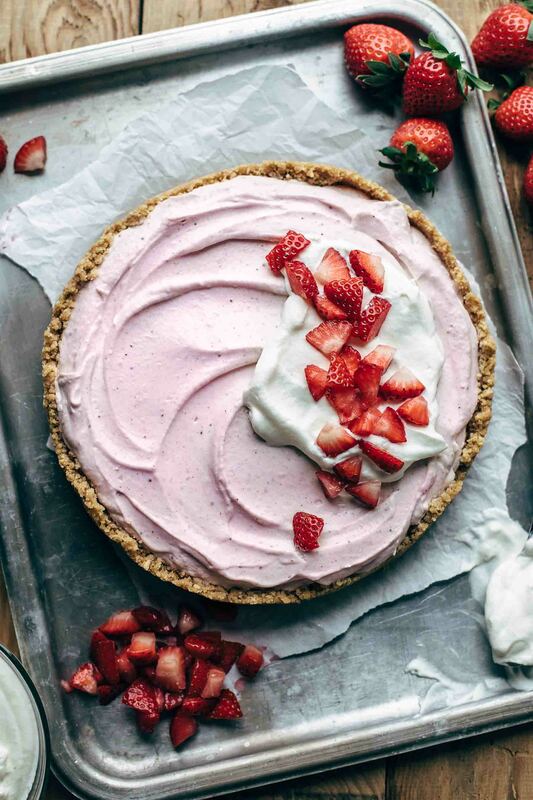 I have this No-Bake Strawberry Cream Cheese Pie Recipe on my blog. This is a completely no-bake recipe, even the crust is not baked. You could replace the graham crackers with Oreos for the crust. Then replace the strawberries with crushed Oreo cookies for the filling. Hi, can I ask for baking this cheesecake, is it bain-marie? Hi Irene, No it isn’t baked in a bain-marie. 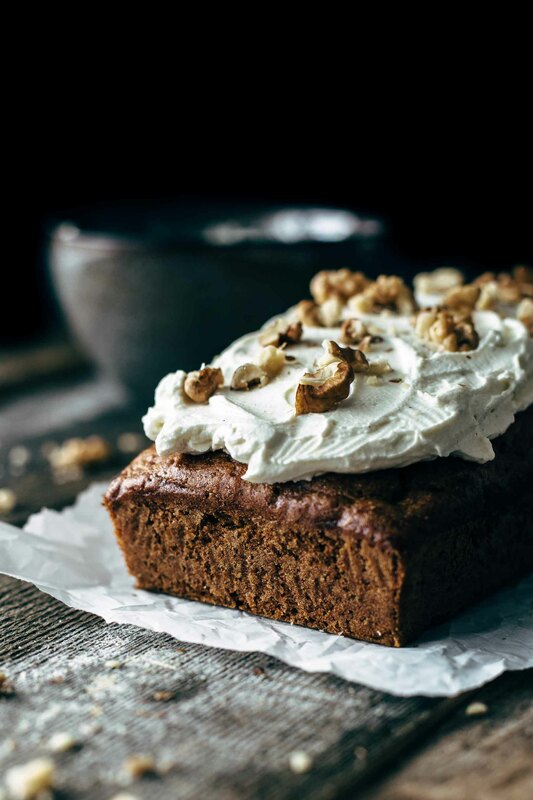 Baking the cake in a tray of water will make a huge difference with the cracking. You can bake this cheesecake with the water-bath method if you prefer it. Hi! 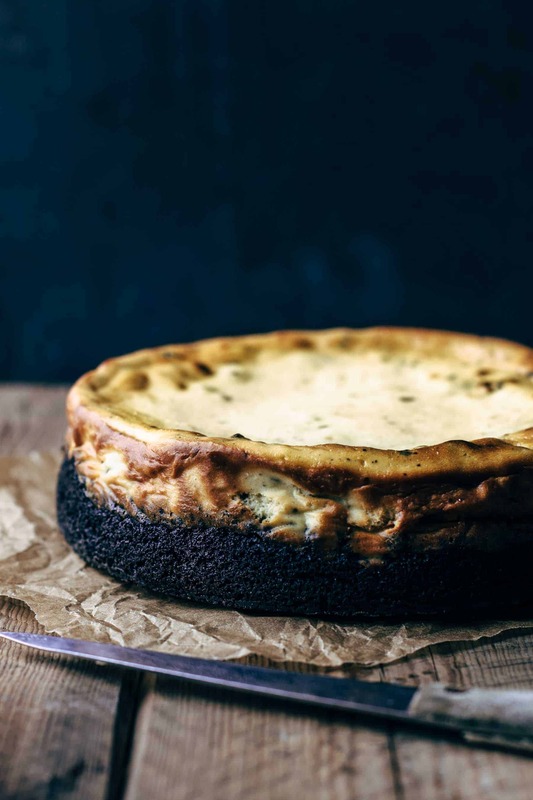 I want to make this but with a brownie crust instead of the Oreo crust (bake a brownie mix in the springform, then pour cheesecake batter over it and bake the cheesecake). Do you think the baking time for the cheesecake would be the same? More? Less? Hi Meredith, that sounds super delicious! I have no experience with a brownie crust. However, the filling (cheesecake) itself needs the same baking time no matter which crust it has. But I have no idea how long you want to prebake the crust. This will be depending on the thickness of the crust. So I just made this as a regular cheesecake for work tomorrow. I thought it was weird you hadn’t said to spray the sides of the pan at all, but figured it must just be something with this batter. The second I poured the batter onto the crust I realized it must be because when you say line with parchment paper you mean line the whole pan, right? All the cheesecake recipes I’ve been making lately always have you line just the bottom of the springform with parchment and then spray the sides. So basically, the edges of the top half of my cheesecake have no greasing protection. Is ther anything I can do once it’s done to try and make it not do terrible things when I unlock the springform? I should have mentioned I literally just stuck this book n the oven. I mean, I definitely can’t redo everything so I had to just throw it in and hope for the best lol. Let the cheesecake chill in the fridge overnight before you unlock the pan. I know this so good! I line the bottoms and the sides of my pans with parchment paper by cutting out a circle for the bottom and strips for the sides. Sorry that this was not clear. I suggest running a sharp knife around the edges before unlocking the pan. I hope it turned out well. Cracks on the surface you can hide with whipped cream and Oreo crumbs as a decoration. Once with your graham cracker crust you use on your other cheesecakes, and the filling done plain without the Oreos. Then I made homemade caramel sauce to put on top. We only have 7 people in my office at work… I only left with 2 pieces, because the rest was inhaled! Then for book club I made a brownie bottom, then a layer of chocolate ganache on that, then I used the cheesecake portion of the above recipe (with the Oreos) and baked it on top of the brownie/ganache. Then I made a chocolate Oreo mousse to go on top. It was absolutely divine!! I had no problem with the first one (the one where I didn’t spray the sides of the pan). I let it cool overnight and then ran a hot knife along the sides. It came out beautiful. Thanks for this amazing recipe!! I am one of those people who say they cook, but don’t bake. I am trying to expand my skills and do more baking. Last night, for a Christmas Party with friends, I attempted my first cheesecake. I did have a couple of minor cracks, but they were easily covered by a dab of whipped cream. Most likely from overbeating a little. It was done in 45 minutes. The best part, the guests raved about it! Even up against some amazing toffee and a version of Alton Brown’s Bourbon Pecan Tart, it won the night. Thanks for the great recipe. Thank you so much for your feedback. Happy holidays! If I wanted this cheesecake as minis in a muffin tin, what would I need to change in the recipe? I’ve seen other Oreo cheesecake recipes that are specifically formulated for muffin pans, but your cheesecake truly looks the best. I would go with the filling of that mini recipe and make an Oreo crust. Therefore, I would take 12 Oreo cookies incl. filling + 3 tbsp butter, melted (the half of the Oreo crust recipe of the 9″ cheesecake). And crush additional 3-4 Oreos and crumble them into the filling. Hope that helps! Thank you so much for your quick reply.I’ll try it! Hi Karrenea, I’m happy that you like the recipe! Yes, hiding cracks with whipping cream is the best to do. Maybe you bake the cheesecake a fee minutes shorter the next time to prevent cracks. Great, I will search for it on Pinterest! Thank you so much!